Join Sokol Blosser Winery for an absolutely stunning view and 4-course Dinner at the Resort at the Mountain. Enjoy Sokol Blosser wines paired with Chef Paul Bosch’s cuisine outside on the golf course greens and under the stars. Dinner begins at 6 pm. 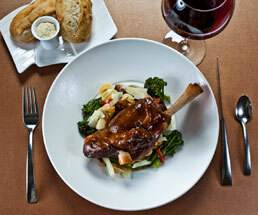 Call Bonnie at 503-622-2220 to make reservations or simply to learn more about the specific menu and wine pairings. Nine & Wine at The Resort Golf Course. Greens fee, cart rental, three appetizer and wine stations on the course, prizes and awards at Mallards Cafe & Pub for only $50. 4:30 PM Shotgun Start. To coincide with a sunset start time, The Resort at the Mountain’s Executive Chef Paul Bosch has designed a magnificent four-course menu to be paired with delightful wines of Oak Knoll Winery. As unique as the menu is its awesome location -- on Foxglove Nine of The Courses! Call Bonnie at 503-622-2220 to make reservations or simply to learn more about the specific menu and wine pairings. Wine Down Wednesdays at The Rendezvous Grill: 2-5 PM, $2 off all wines by the glass and $8 off bottles over $20. Buy a bottle to have with dinner at the Rendezvous or a bottle to take home—they have their retail license too! Check out Timberline Lodge’s renowned and award-winning extensive wine library of current and past vintages of Northwest wine paired with the inspired cuisine of Chef Jason Stoller Smith at the Cascade Dining Room. Splurge on a special night out to one of his intimate Winemaker’s Dinners at Silcox Hut. The Villages of Mt Hood are only a one hour drive to Hood River wineries to the east and about 1 1/2 hours to the world-famous Willamette Valley wineries to the west making it easy to take a day trip and go wine tasting. Also, since we are in the epicenter of several great grape growing regions, our local stores have pretty amazing selections of wine too!